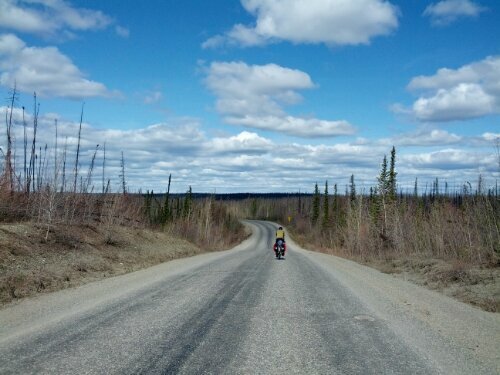 The road from Bell II to the town of Dease Lake is 150 miles long and we had decided to make it in two days. When I last left off we had covered the first 96 miles in a day, stopping in Iskut. As such our next day was to be a bit on the short side, covering the remaining 54 miles. 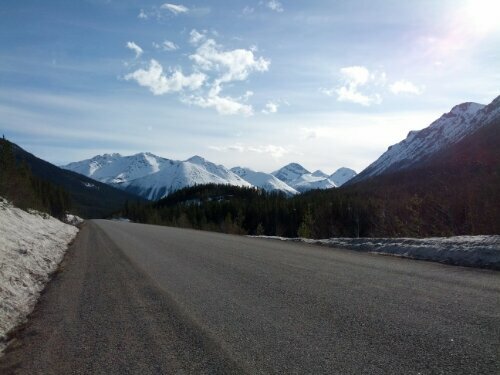 We were lucky to split it up this way; the road from Iskut to Dease Lake is hilly. A few several hundred feet climbs greet us on our way out of town and we come upon a long downhill into a valley. The best kind of downhill is one where you can take full advantage of the hill to either rest or increase your pace. This hill provided neither opportunity. Winding through steep switchbacks and gravel we lose over a thousand feet of hard-earned elevation, riding the brakes the whole way. Across a river, the road turns back upwards into a never-ending climb. Stopping for a quick lunch it begins to snow and we get back on the road. As the road keeps on going up, more and more snow appears on the sides of the road and numerous streams wind their way through the snow and pine forests. The snow increases in intensity as we reach an alpine meadow at the top of the pass and a lone swan glides across the surface of a small lake. Eventually we reach the pass and are rewarded with a long downhill into the town of Dease Lake, crossing the continental divide into the Arctic. Dease Lake is the last town for a long while so we stock up on groceries. This mainly means candy. Heading north out of town we are peppered with rain showers but luckily none of them last too long. As soon as the terrain begins to get boring we run into more spectacular mountains. Crossing each new mountain pass gives a new view of more unfathomable stretches of forest. The forest seems to be endless and I have to remind myself that it is not, for it is precisely its end that I pursue. Near the top of another pass we call it a day, making camp in a snow plow pullout, surrounded by feet of snow. Back on the road in the morning, there are two small towns ahead but neither of them have anywhere to eat so we press on. Boya Lake provincial park sits a few kilometres off the road and we make the detour in hopes of finding potable water. The water is still turned off for the winter but we are greeted with fantastic views of mountains over a frozen turquoise lake. The park is well maintained and has dozens of campsites, all empty because summer had not yet arrived. It’s a bit eery. Heading north once more, we are reaching the end of the Cassiar highway. The mountains give way to rolling hills and miles of forest along the road has burned down. The less-spectacular scenery appears to have affected the road construction crew as well – they seem to have thrown in the towel. The road up here is hardly graded – flat sections of road are punctuated with extremely steep hills and between the worsened road conditions and unspectacular view the ride begins to become a bit of a chore. There’s an acceptable spot on the side of the road and we make camp for the night. A thumping noise persists throughout the night – it sounds a bit like a motorcycle engine starting or a large heavy ball bouncing on dirt. Very strange. In the morning while getting our food down from a tree we find the source of the noise – a pheasant flapping its wings in a bizarre (assumed) mating ritual. At this point that I should probably mention that it is difficult to keep my phone charged when spending many days between towns. As such I don’t have many photos for the blog, but there are plenty to show when I return from my trip and am able to get the photos off of my camera. 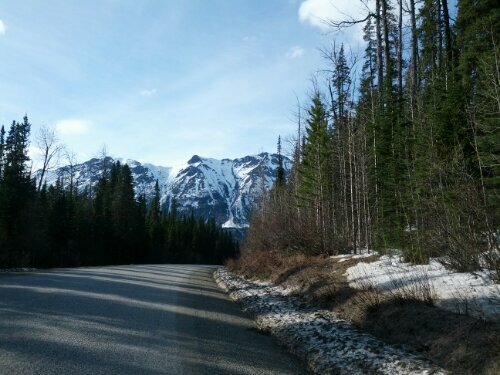 Another day brings us to the end of highway 37, the Cassiar highway. The border into the Yukon is four kilometers before the end of the road and we stop for photos and to use the restroom. While admiring the signs for the upcoming new province, a grizzly bear appears off the left side of the road and scampers away. We pull onto the Alaska highway and stop for lunch in Nugget City. Once again the definition of city is being used rather liberally – there is nothing here but a combination gas station/lodge/restaurant. 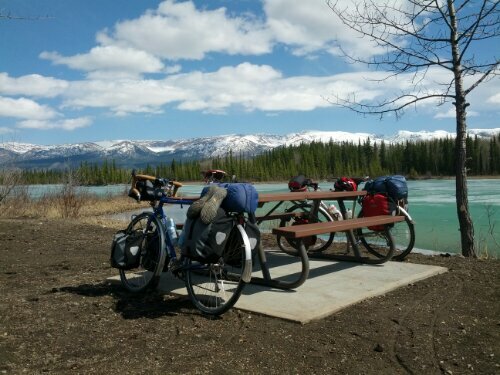 The first forty or so miles on the Alaska highway are bland; rolling hills through pine forest that move by at a glacial pace thanks to a heavy headwind, but mountains eventually return and we make camp in a section of not-too-dense forest off the road. Another day, more mountains. We cross the continental divide again, back into the pacific and a wild cyclist appears on the road in the middle of nowhere. He’s an older gentleman on a road trip with his wife and every afternoon he takes a bike ride. We speak for a bit and ride on into the rain. The days are blurring together once more. We camp on the side of the road again and yesterday’s rain turns into today’s snow. Three rabbits run in circles around a bush off the road and a caribou trots across the highway while we at taking a break. The snow relents for just enough time for us to make camp and dinner before returning even stronger. It piles up on our tents overnight and the temperature continues to drop. Finally it’s just one more day until Whitehorse, the largest city in Yukon. It’s been six days since my last shower and twelve since I last did laundry so I’m ready to make it to a city for a rest day. The temperature is even colder and I add a hat and buff to my already long list of worn clothing. Unfortunately Donald is rather tired in this last stretch and the day turns into a long slog, arriving in Whitehorse at ten at night. Luckily it practically never gets dark now and there’s plenty of sunlight left even at such a late hour. We’ll be taking two rest days here in Whitehorse before starting the leg to Alaska. Even though the photos are from the phone, they are beautiful. Glad there were some blue skies, along with the snow. Ah, the clouds in those photos! Love those clouds. As K. Patchen wrote, “Only the thinking of clouds keeps the world on its untroubled course.” May those clouds make the rest of your course trouble free.